Impressive 4 Bedroom - Mooroopna. At just over 24 squares of living, this property offers a great deal. The master bedroom has an ensuite (shower, spa bath, vanity & separate toilet) and walk-in robe. 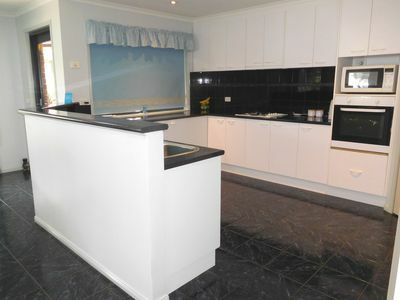 There is a formal lounge at the front of the home, a central, large kitchen with heaps of cupboard and bench space and the tiled meals area steps down to the family room. Ducted heating & cooling throughout. The remaining 3 bedrooms are all a good size with built-in robes. A kids retreat or rumpus room allows plenty of space for them to play and includes a large walk-in store cupboard. A centrally located laundry and separate toilet are in close proximity to the main bathroom. Outside is a large undercover alfresco area, double garage with auto door and double gates on the side for backyard access to the 3 bay shed. Land size 823sqm. Walk-in store cupboard in Rumpus Room. Shed has concrete floor & power with 2 sliding bay doors and pot belly heater. Pergola has pattern concrete floor & Colorbond roof.